Experts say about 40% of the carbon dioxide that contributes to climate change comes from buildings. Most of us think it results from energy needs such as air conditioning and lighting. In truth, many greenhouse gases come from resource extraction, manufacturing, and production of building materials. The most commonly used material for construction is concrete. However, in this age of green building not all concrete is made equal. There is regular concrete used in most structures and there is concrete that has low volatile organic compounds (VOCs). Volative Organic Compounds can seep into the air, just like the ones we use for all of our polished concrete floor installations. VOCs can be found in building materials such as concrete, conventional paints, adhesives and finishes. These compounds emit harmful gases that when mixed with other pollutants such nitrogen dioxide can create smog. The mixture of chemicals results from the release of VOCs from, largely, industrial processes and the nitrogen oxides (NOX) produced by car exhausts and the combustion of fossil fuel to produce electricity. Imagine, just by virtue of being erected, a building can actually create damage in the atmosphere and people’s health. Particularly if its concrete has a huge amount of VOCs. How can I make sure I don’t build with VOCs? When you source materials like paint, you will see labels indicating “Low-VOC” and “zero-VOC” paints, meaning they contain a reduced number of grams of VOC per litre (under 150 grams for low-VOC and under 5 for zero-VOC). But for things like concrete floors, it’s a little trickier than that because you can’t buy the floors straight from a hardware store. What you can do is find a company that has been certified by the Green Building Council of Australia that their concrete floors pass the green materials standard set by the council. Check if they have the Green Star, Australia’s trusted mark of quality for the design, construction and operation of sustainable buildings, fit-outs and communities. In one of our past projects in Barangaroo, we received a 6-star rating for our polished concrete floors. The council audited our operations and our materials. In the end they awarded our concrete floors the Green Star. What makes polished concrete green? A properly installed and sealed polished concrete can last a lifetime and may never need replacing. 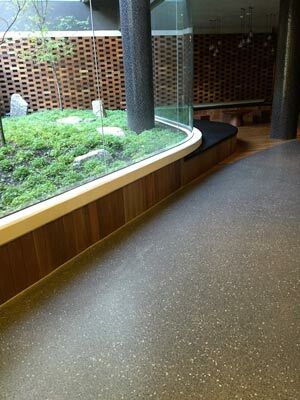 Few flooring materials can claim they are as sustainable as polished concrete. 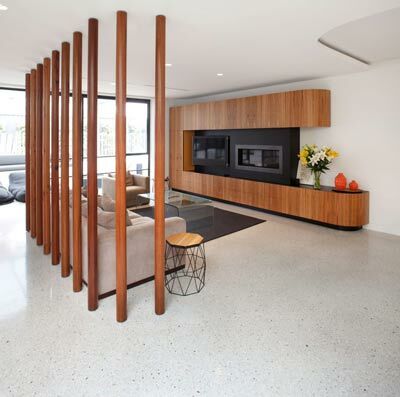 Polished concrete floors are also made with sustainable materials. The predominant raw material for the cement in concrete is limestone, the most abundant mineral on earth. It can also make use of waste by-products such as fly ash, slag cement and silica fumes as partial cement replacements. The thermal mass and ability to retain heat of concrete floors makes them ideal for passive solar home designs. In winter, the concrete floors can absorb the heat from the direct sunlight and release the stored heat as needed at night to keep rooms warmer. Conversely during summer and in hot climates, concrete floors shielded from the sun will stay cool longer and can actually help lower air-conditioning costs. Polished concrete floors are also more economical than hardwood flooring and tiles. You don’t have to buy and install an additional floor covering to put on top of the floor slab. They are also durable and lower maintenance. This means polished concrete floors can help you save on recurring maintenance and replacement costs typically associated with less-enduring flooring materials, such as carpet and vinyl tile. If you’re thinking of making your shop or building greener with polished concrete, why not contact us today?